In Judaism, the most fundamental understanding of God is that He is in every sense The Perfect One. The most theologically important implication of His perfect one-ness is that He is perfect in unity. We have seen elsewhere in this website some of the implications that the perfect unity of God has in the theological sphere, but we have yet to explore the implications it has for the process of creation. That is the purpose of this paper. If we begin our exploration with God alone in the realm of existence, then there is a question that comes immediately to mind, and that is of where Creation came from. As God was alone, He was identical to the realm of existence, and so there was nothing in the realm of existence that could conceivably have yielded up the stuff of material existence other than God Himself. There is really no other rational position to take on this matter. However, many on both the Jewish and Christian sides of the debate have nonetheless insisted that God created ‘out of nothing’ (ex nihilo), and indeed specify that the ineffable ‘stuff’ of Creation did not come from God. However, they must also come up with a rationally tenable alternative, because the contention that Creation came from God is rationally sound. This they have, unsurprisingly, failed to do, simply declaring it to be so. Moreover, by their refusal to acknowledge the obvious implication of the perfect unity of God, they are contradicting no less esteemed a figure than Simeon ben Shetach. It is related in the Talmud that Simeon and Honi the Circlemaker were having an exchange, in the course of which Simeon referred to God as our “Father and Mother“. It must, however, be stressed that any Divine essence that God transformed into the fundamental stuff of creation ceased to be Divine as soon as it was created. There is, therefore, a relation in essence between God and His creation, but there is no relation in holiness. 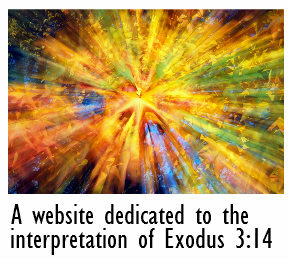 If at this point the reader will consult the Diagram in Part II of this site, they will understand why it is said that God began creating by His will, and subsequently gave form to the beginning of His creation by His word. In God, will is ontologically anterior to mind, and mind to word. Contrary to what the Evangelist John has to say in the opening verse of his Gospel, in the beginning was not the word (John 1:1). In the beginning was God alone and then God with His formless creation. Only then did He utter His word. Because it is from God, we can be certain that the stuff of Creation was in the condition of perfect potential, anticipating the formative imprint of His word. This is the sequence of events that makes perfect sense and it is the sequence of events described in Genesis 1:1-3 and there is therefore no reason to doubt it. However, in Lurianic Kabbalah there is a theory that God withdrew into Himself in order to leave a place for His creation (Zimzum), but that theory is highly problematic from a metaphysical standpoint. To begin with, if God withdrew into Himself, does that not imply that He must have changed in order to do so? And what was the nature of the place He left behind? And is it really possible for the Divine essence to be rent asunder, even by God Himself? Moreover, when we say that God is omnipresent, are we not implicitly accepting the view that He did not withdraw in order to make room for His creation? For these and other reasons, this putative scheme of existence is increasingly rejected by those with an interest in Kabbalah. However, the alternative is not straightforward. If we say, quite rightly, that God did not withdraw to make room for His creation, then what is the nature of our relation to Him? After all, we also say that God is perfect in unity or simplicity, but how can that be so if He can occupy His place and our space at once? How is there any place for us with God if He is perfectly non-composite, infinite and omnipresent? We must simply start with what we know. There is life in creation. The Divine essence is identical to life. Therefore, there is Divine essence in the same place as Creation, and so the presence of God in His fullness is evidently not at odds with the co-presence of material Creation. His creation is infused with His essence in the form of created life, but the essence is everywhere else in creation presumably doing whatever work it does in inanimate systems. So what is the nature of our relation to God? I have no idea. This is where I come face to face with mystery. In the final analysis, therefore, we can know that God created, and we can know why He created, and we can even know in general terms how He created, and so we need not be concerned if we cannot know precisely what His relation to us is. It truly is a mystery. Babylonian Talmud, Berakhot 19a3. See also Bialik and Ravnitzky’s The Book of Legends, Legends from the Talmud and Midrash, NY: Schocken Books, 1992, p.203, n.2, where the phrase “Father and Mother” in Berakoth 19a3 is described as “a very bold epithet for God the Creator”. Scholem G., Encyclopaedia Judaica CD-ROM Edition > Kabbalah (J. Mysticism) > Lurianic Kabbalah > Zimzum.